I have a very strong-willed toddler. She wants to do everything for herself and I am glad to have her try. 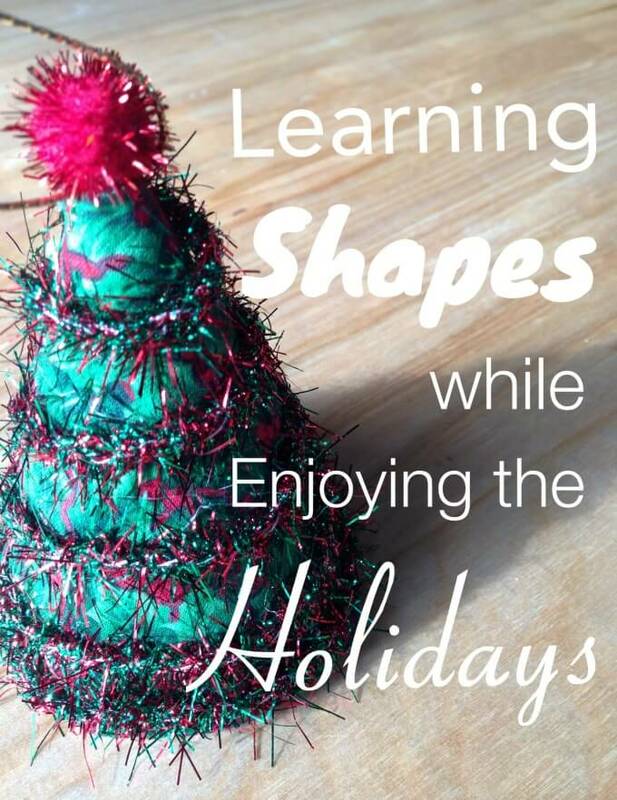 However actually fostering an environment that encourages her independence has been a little trickier because of making sure items are safe, easily accessible, and well-thought-out for her. 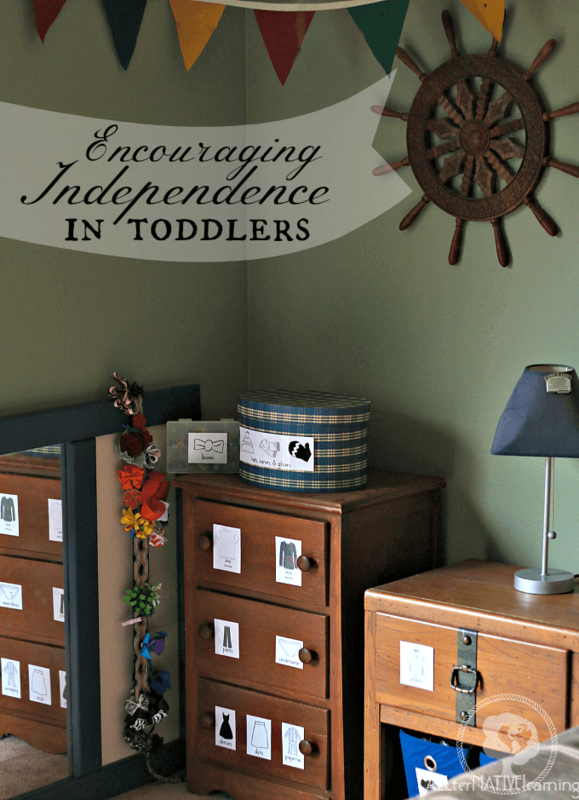 That being said, encouraging independence in toddlers is vital for them. It helps build their self-confidence, works on practical life skills, and makes them feel in control. (And who doesn’t like to feel in control?) 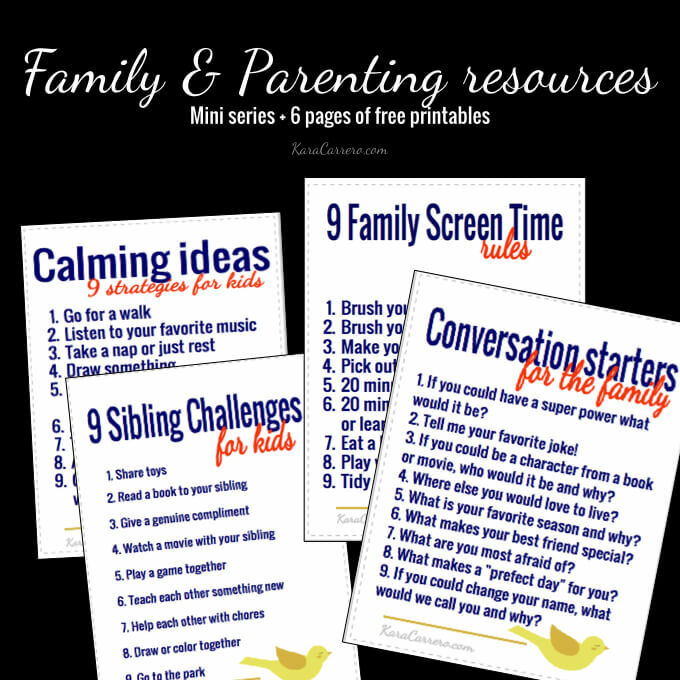 Here are just a few ways we have been working on fostering my daughter’s independence in our home. I cannot even express how thrilled my daughter was when we changed up her dressing area to be more of a Montessori-inspired changing area. Instead of one of those big, clunky dressers that had heavy drawers, we switched it up to a small, light-weight wooden dresser that I found at an antique store and easy access bins. Granted, the dresser is probably just a three-drawer end-table, but nonetheless, it serves our family perfectly. I chose three drawers because it would be tops, bottoms, and dresses/underwear. I really like the way that it is separated. Also, it cannot be easily pulled over on her and is lightweight anyways. Each drawer is separated with expandable drawer dividers. This allows us to separate t-shirts from long sleeve, dresses from skirts, etc.. I placed a lamp that was easy to use and not easily breakable on the adjacent nightstand and a mirror perpendicular to the dresser. And that’s how her little dressing corner was established. After getting her corner set up, I worked on downsizing her clothes. I wanted to make each drawer more manageable. 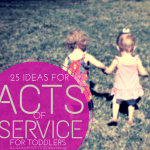 When a toddler has 50 options, it’s easy for them to be wishy-washy. However, having a few great options helps them take a little more control and be a little more confident in their decision making. (This is one more reason why we try to stick to solid colors and/or clothes without graphics or much of a design because it makes pairing things much easier). I also created a file on my computer to help label her drawers and bins. This would be a visual reminder of where each article of clothing belonged and lived. While I have changed this up a little over time to suit her needs a bit better (like shuffling where pajamas go and that jackets are now in our hall closet with mom and dad’s jackets), it is still ultimately the same. I have included a free download of the clothing tags I made. While it does include bows, dresses, etc., they can still be used for boys’ rooms by just omitting what you would not use. Please know that I made these myself and are my own hard work to get this file put together. Please, if you download, do not share the file, rather my site to direct others to this resource I am providing. Thank you! Step Stools – Giving my daughter the ability to carry around a light-weight stool in order to reach things she otherwise couldn’t has been an invaluable tool in fostering her independence. 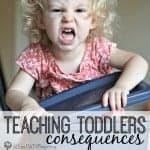 While it has gotten her in trouble for getting into things she knew she wasn’t supposed to, this lends us the opportunity to talk about appropriate behavior and boundaries. It has also been a blessing to have a few stools in the house, allowing her to move a little more freely and be a bit more independent. Even at 6 and 7 months old, we placed a stool at the edge of the couch and my daughter could easily climb up and down off of the sofa herself before she could even walk. Consider have a small plastic stool and even larger wooden stools and multi-step stools. All are great to have around and in different places for different purposes. We also use a wooden chair that has rungs in the back that has been easy for her to climb up and steady herself. Toilet Seat – I am not talking about a small one on the ground that you have to dump out or even one of those cushy ones that sits on top of the toilet bowl. I am talking about replacing the seat you already have with one that has a built-in child’s seat. You would be surprised the difference this makes in the eyes of a toddler. They are not “special” because they have their own chair, they are like everyone else because their seat is all-in-one with the adult seat. 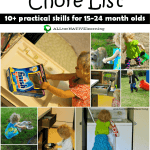 Chores – Getting our toddler involved in chores was something that naturally happened even as a baby. 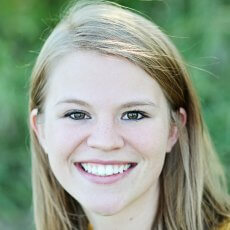 Now as a toddler, she wipes up her own spills, helps take care of plants and pets, and even helps with the laundry. She feels like she is a huge help and even though my own chores may take longer with her help, that’s not what matters in this instance. 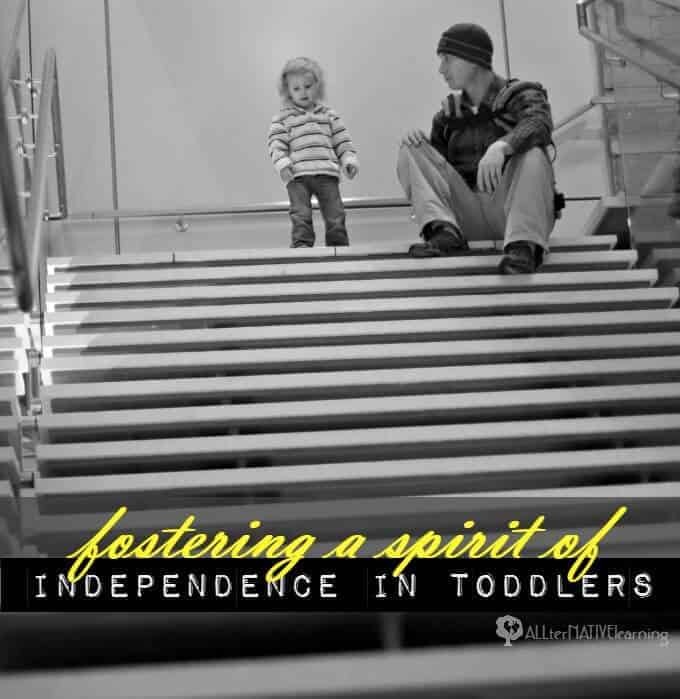 It’s about truly encouraging independence in toddlers and letting them know that they are capable and part of the bigger family picture. Choices – We always give options. Usually it’s just two and she must decide between “A” and “B”. We have learned that giving her choices and also teaching her about consequences in choices has really made her think a little more and fostered a bit more confidence in her. She feels independent because we did not choose for her and she knows that she must live with the choices she makes. Trash Can – I got a small, one gallon step trash can that sits across from our real trash can. While I would just have her throw away garbage into the big one, I have found the small one to be more effective. This is because the real one is a big compactor that’s kind of hard to open and the small one is easy access and has the little pedal that she enjoys using. The can we have also has an interior pail so that once it is full, I can make sure she hasn’t thrown away something she shouldn’t have and then she can dump it into the big one. (Sometimes, she confuses what is a dirty dish like a small metal cup for being something that goes in the trash instead of the sink). 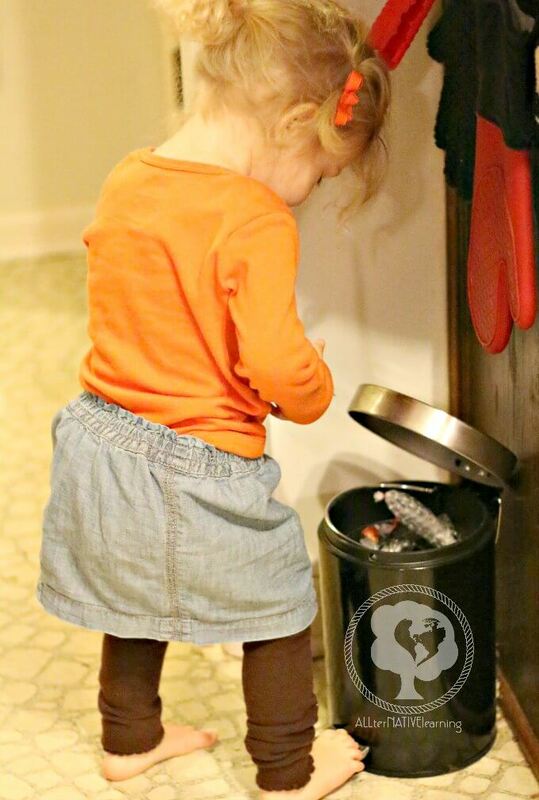 It makes her day too when we ask her to go throw something away on her own. That feeling of being helpful fosters her independent spirit like almost nothing else. 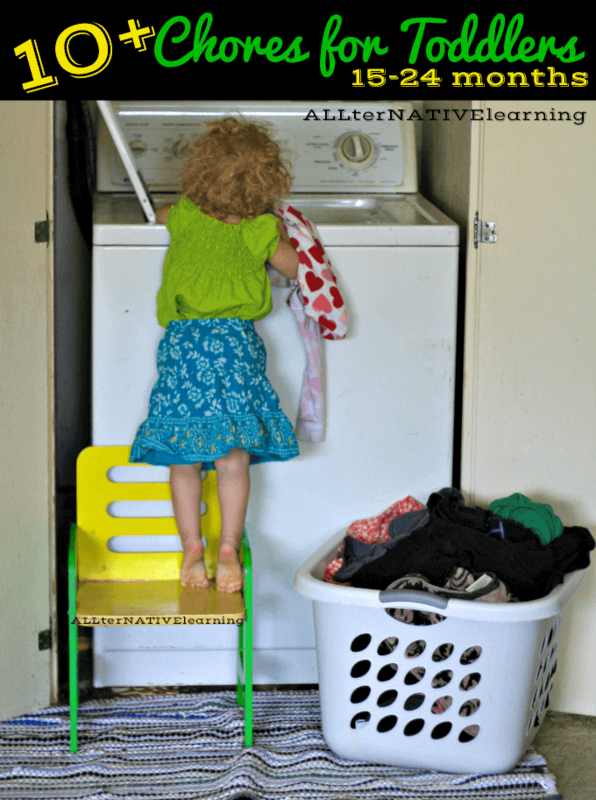 Laundry Baskets – We have two small laundry baskets that sit in front of the big, adult laundry baskets. They are easily accessible and allow her to clean up spills and put away her towels when done. And of course, she can also put her dirty clothes in when she is done for the day. Door Knob Grips – While we don’t have these door knob grips on every door, we have them on the doors that we want her to have free access to. They are actually made for people with disabilities and the elderly, but I found that putting them on vertically allows my toddler to easily reach and get the door open herself. (Each box has two in it so we have one on each side of one door and then we put them on one side of doors that we might want her to get in or out of but not the other way around necessarily). When She is hungry and wants food or thirsty and needs water, she has some options at her disposal. And even if I have to help her, she feels so much more independent when I ask her to “go get a cup out of your cabinet” than having me do everything for her. We do go through a lot of dishes in a day and week because she always gets a new cup/bowl/plate even for second and refills, it’s the fact that she so desires to be able to access all of it that is more important than the extra dish washing for me. Find a more extensive list of products on Amazon that foster toddler independence with descriptions.